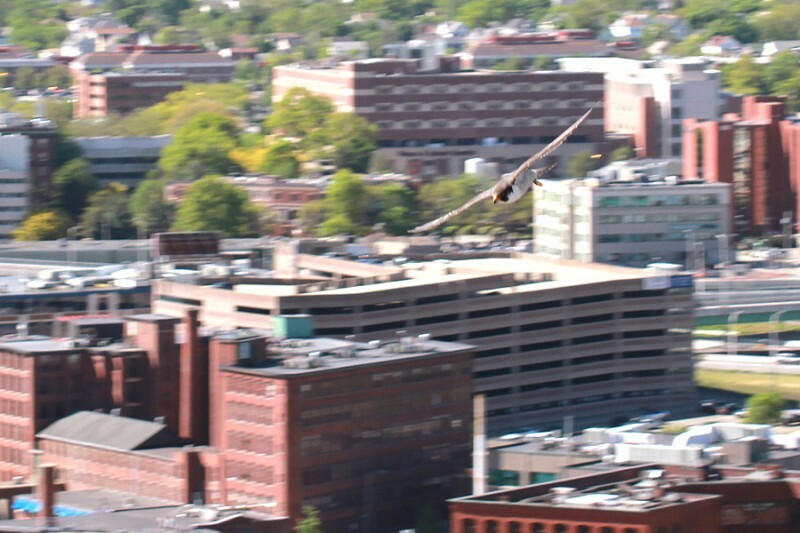 05.14.12 Filed under Peregrine Falcons. Post a comment. 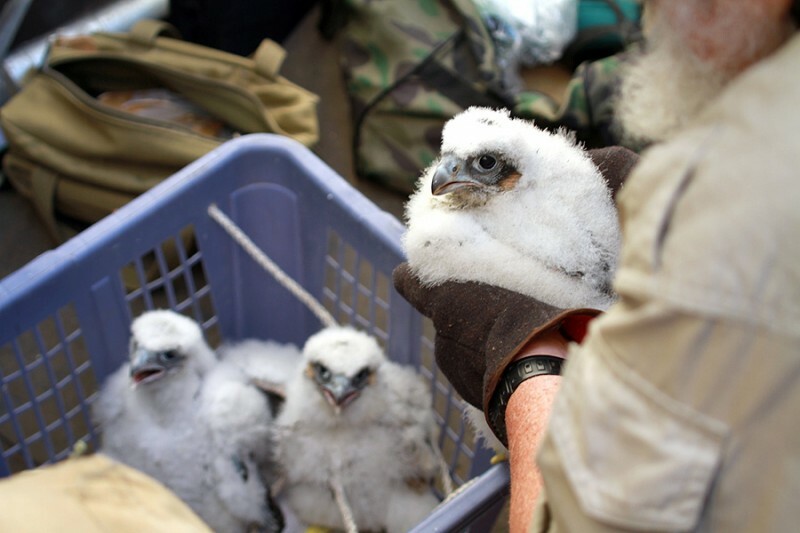 Last week I photographed the banding of four peregrine falcon nestlings (eyases) here in Providence, RI. 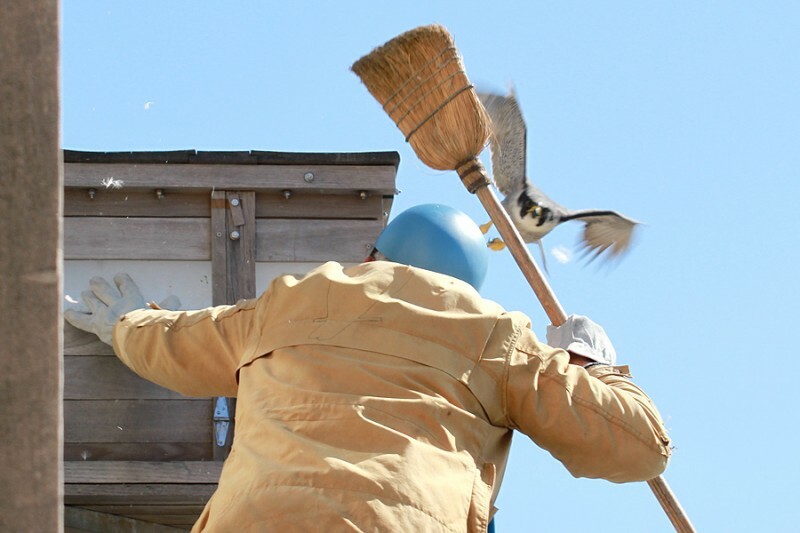 As always, Joe Zbyrowski was bravely in charge – below you can see him removing the birds from the secret back door on the nest box. 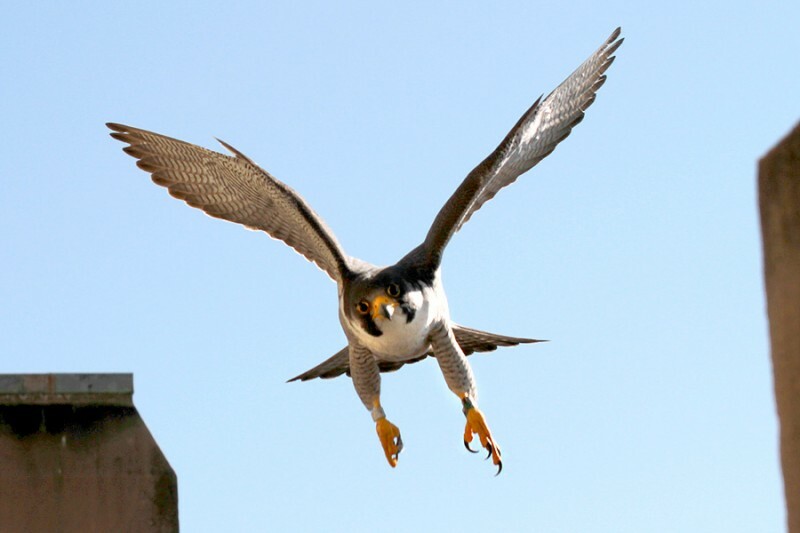 The adult falcons fly around screaming and diving at us, but they are not too disturbed because they continue to care for the nestlings and come back to the same box every year to repeat the breeding process. 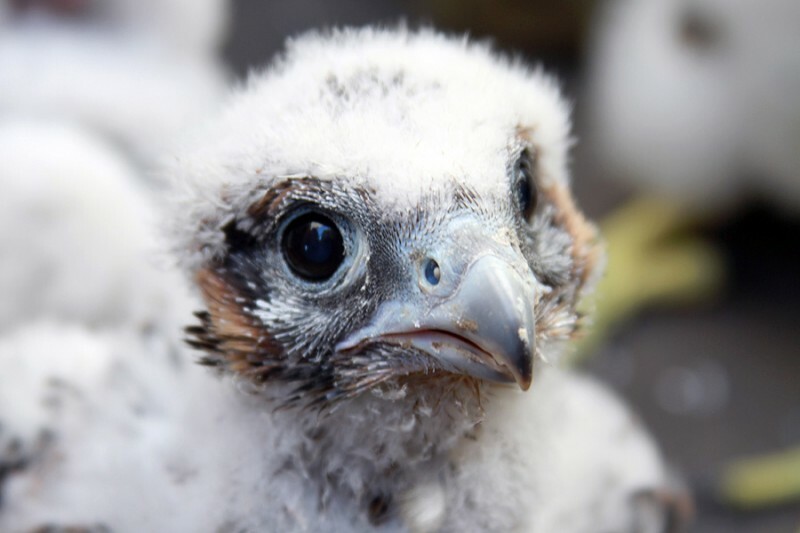 In fact, since the nestlings are unharmed, the parents might feel pride that they successfully defended their brood. 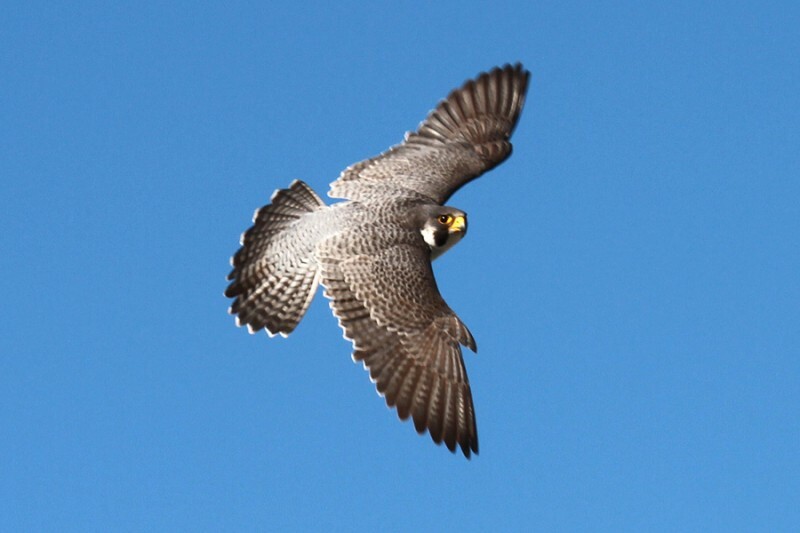 Since 1999, the female falcon above has reared over 30 chicks. For complete information about the banding, please watch this great video from the Providence Journal in 2008. UPDATE: On May 31 at 8:05am the last nestling left the nest box. Hopefully I will see them around the city and get photos like these from last year. Thanks for bringing this amazing day to us Peter!The photos are spectacular! Is there a webcam for the biltmore sign??? I live in Coventry rI and heard this ear piecing screaming from the tree tops. Im a bird fanatic so i grabbed my Cell phone wich records in 1080p and mt binoculars. it took me a half hour to locate the bird absolutely positive it was a hawk. I glanced up and spotted a white bird with a black spotted chest. no sooner had i grabbed my laptop and looked this bird up these pictures came up. This was 120% the bird that was screaming. OMG is was so big and absolutely he most beautiful bird i have ever seen. I did get video of it it was awesome. if you guys are interested i can send you the footage and you can confirm that it is this bird!! Peter, your pics are awesome. What a fierce mom she is!! I see she made a hit. I saw your post in my email but it wasn’t on our fb page. Thanks again for the pics. Males, females? Thanks Donna – I’ve been told there’s 1 female and 3 males. Mrs. Marino’s third grade class in North Kingstown has been following the falcons daily since the babies were about 4 days old. They are amazing and your pictures are too. We are impressed with the mother’s claws and the way she protects her babies. Our class is wondering at what age will the babies be when they begin to fly. Thank you for putting up the webcam so we could have this experience. Hello Mrs. Marino’s Third Grade Class! 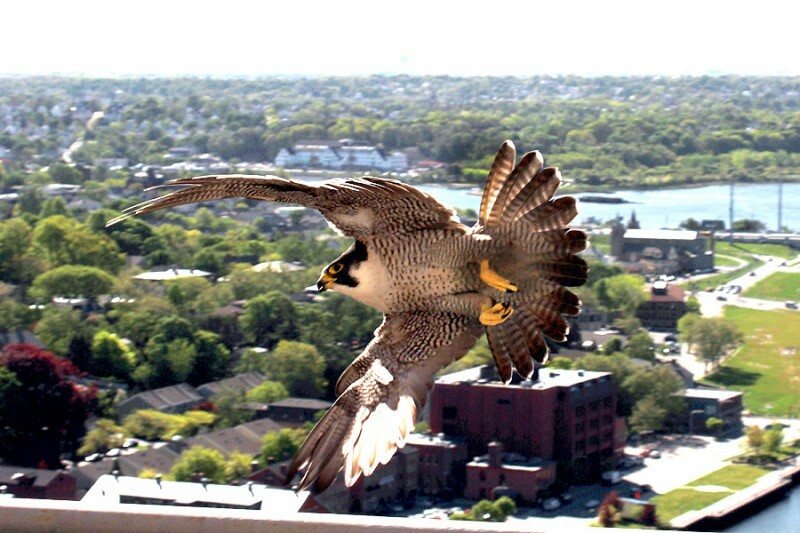 Thank you for checking out my photos, I’m glad you like them – and great to know you’re enjoying the falcon webcam as well. The babies should be ready to leave the box in early June. Then the parents will teach them how to fly and hunt for a few weeks… and then they will leave the city to find their own territories. Thank you for responding. My class was very excited. We will continue to enjoy watching the babies. Peter, your photos are breathtaking! I have some questions. As far as the hatching order, is there any way to know which one was the female? Is the live streaming video recorded? Will the first flights for each one become available as videos on the web? Thank you in advance for any answers. And a MUCH bigger THANK YOU for your amazing pictures! Thanks for sharing these awesome pictures! 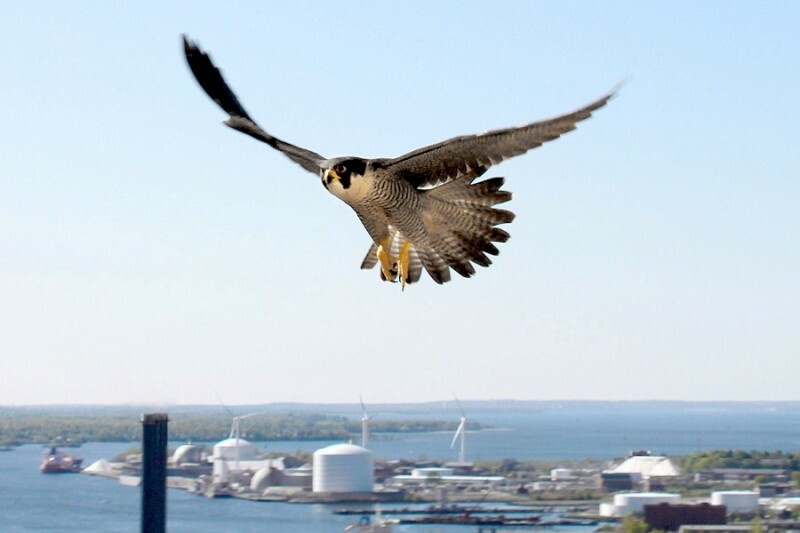 We’re so fortunate to have these birds in our area, and to have the opportunity to learn more about them. 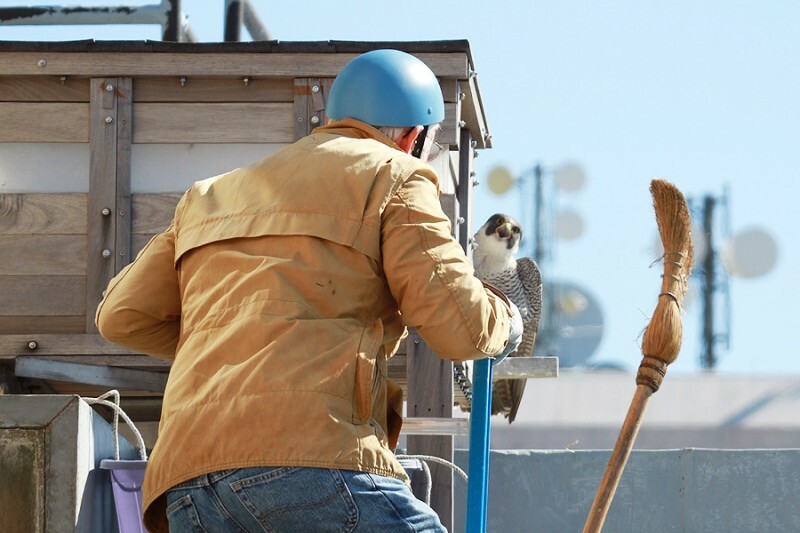 while watching the web cam today, I noticed one of the peregrines had gotten out of the coop and was struggling to get back in, is there anyone that watches this and is able to get it back in? 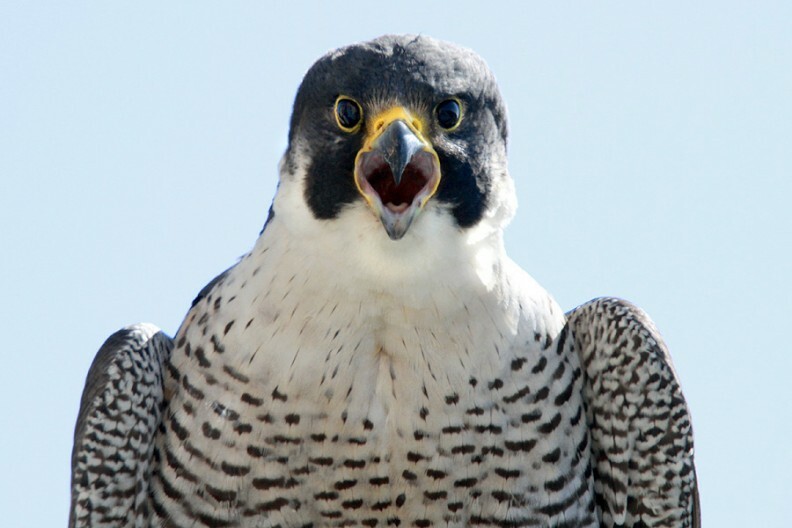 hi Mike – the young falcons will leave the box one-by-one over the next week or so. Unfortunately the first one picked a rainy day, but it should be fine. 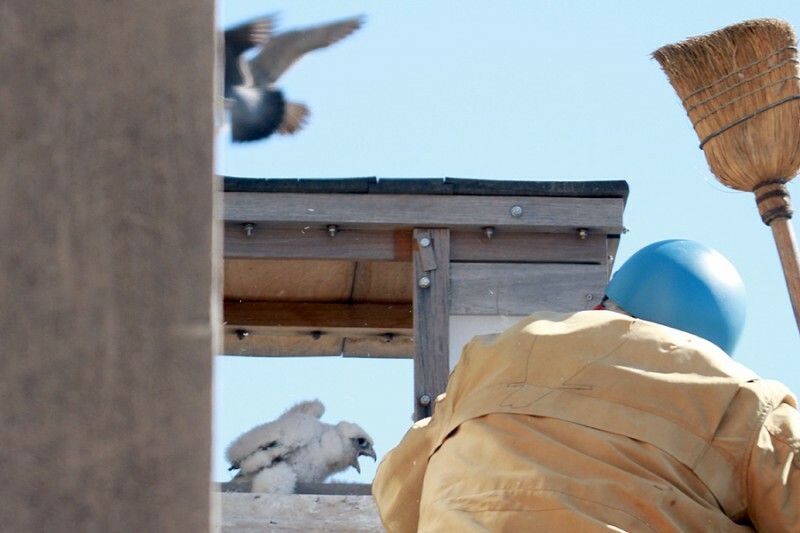 Once they leave the box they usually do not return – they remain nearby on the building and practice stretching their wings, etc. Mom still comes to feed them. 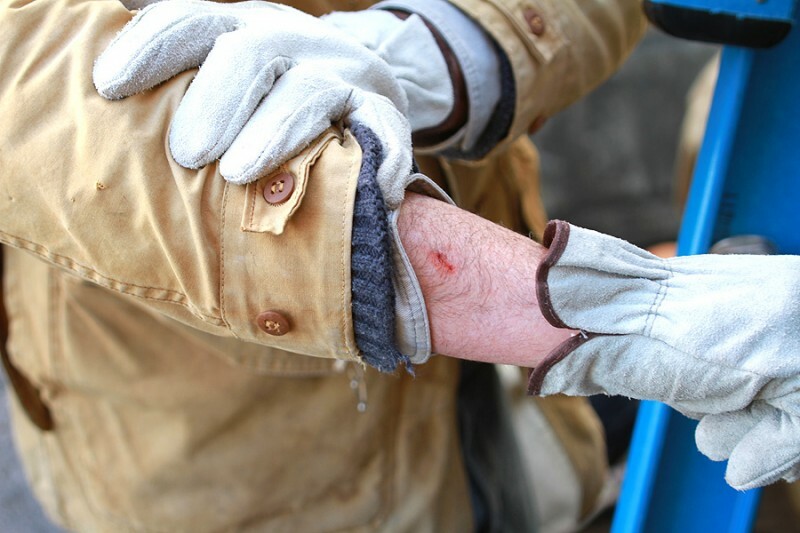 If there’s a problem, someone from Audubon or DEM will come assist the bird, yes… so there’s no need to be concerned, but I worry about them too. I worried yesterday too about the poor falcon out of the box and then he was back in the box later in the day. I wondered how he ever was able to get back in. He did pick a bad day to go on his first adventure. Also saw him walking on the wall on the left. Eeek. I guess they know how to take care of themselves and M and D watch out for them too. So much fun to watch them. hi Mary – are you sure you saw it return to the box? I only see three in there this morning. oh, now I see the fourth one has returned – excellent, good for him. Your pictures are wonderful! I have never watched a bird webcam before and glad we have this opportunity. Did see one leave on that rainy day and this morning one goes to the edge and flaps his/her wings as they all will do. I haven’t seen mom or dad bring food for quite some time,maybe I missed it? They must be getting hungry. Again, thanks for the pictures and chat!! hi Elise, thank you, I appreciate it. I saw them being fed yesterday, so all’s well. The parents are usually perched nearby but off-camera. 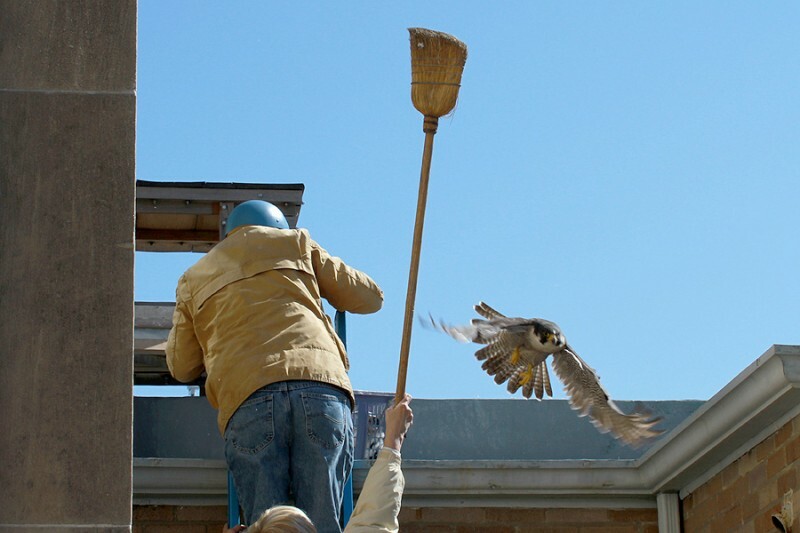 If another bird flies by, the parents quickly chase it away as seen here. Your photos of the banding are awesome! Thank you for putting them on line. I, too, was worried about the chick/fledgeling out of the box yesterday. He/She seemed to be testing his/her wings on roof for a time yesterday. 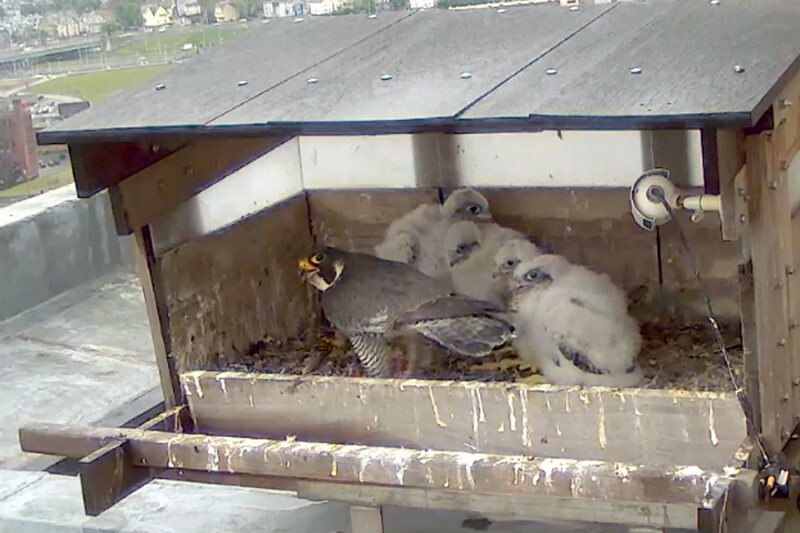 Right now, Wednesday, 5/23 @ 12:40pm, all four are in the box …but one has been pulling on the camera cord at the right. It looked for a time like his foot was caught in it but in any case the camera has been moved as a result of this. Thank you Tony – I’m told Audubon would like to remove the non-functioning camera/wire that is inside the box, but it’s too dangerous at this time. Maybe they can reach it during the non-breeding winter season. Great report and photos! Hats off to you and all involved in RI. 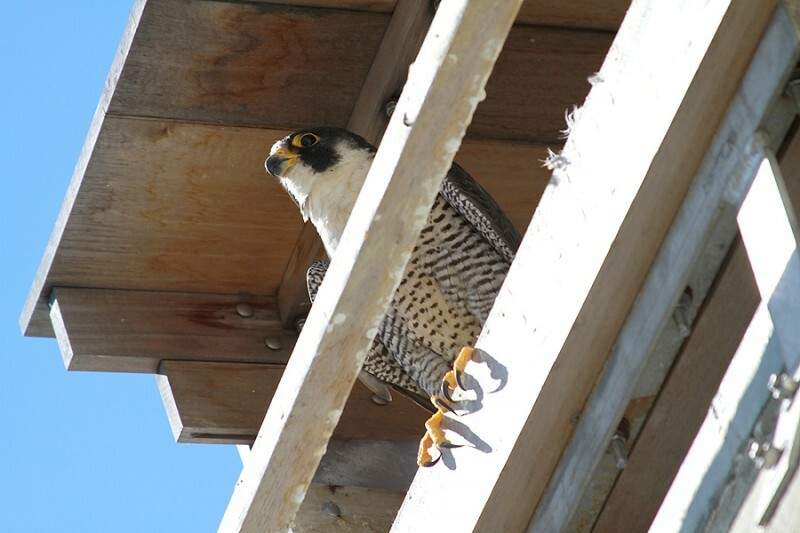 I enjoy watching the nest box and falcons up here in western, NY at the Rochester site. Best of luck to you, your work and all in RI. 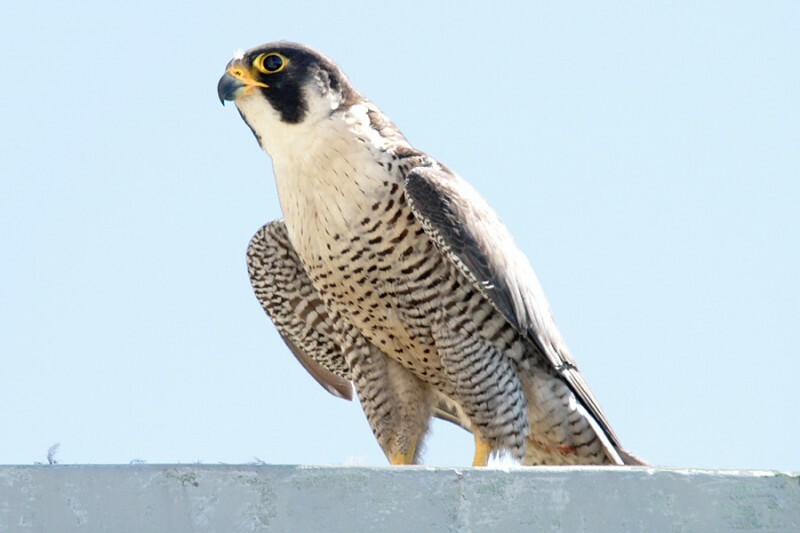 Thank you, John – I’ve been a fan of the Rochester Falcon cam (rfalconcam.com) for a few years now, it’s so sharp! 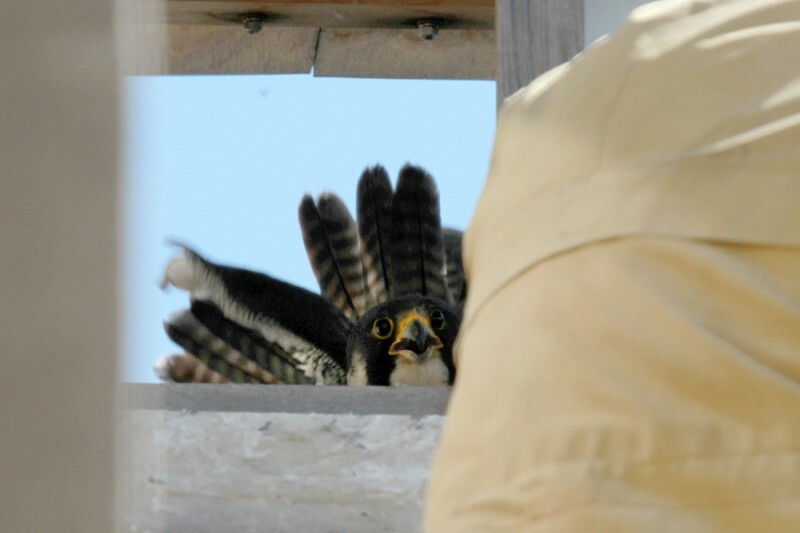 Seems you have more drama there with many different falcons fighting and flirting. Great to see that Beauty is fully recovered now from her battle with Unity. All the best to you as well. Wed at 2:42 PM, mom is feeding the three in the box. The fourth one has gone on another walkabout again and can be seen over to the left. She apparently will feed that one outside the box. It will be interesting to see if he chooses to get back into the box tonight as he did last night. They are so much fun to watch. I’ve seen them get fed at least two times since yesterday afternoon. Thanks Mary. 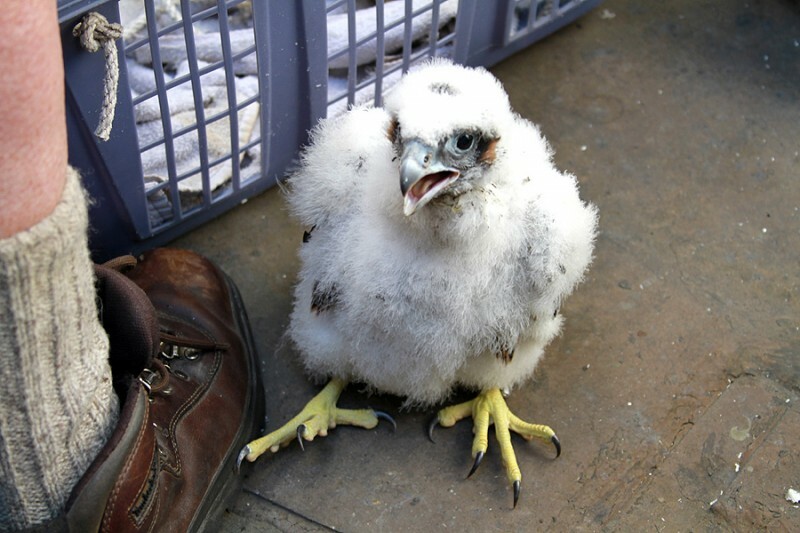 Yesterday I noticed a red band on the ankle of their prey and I’m told that indicates it was a pigeon. A few weeks ago they had a seagull for lunch and I know they also enjoy woodpeckers and flickers. I feel much better to see that the fourth fledgling is doing well and just feeling his/her oats. Not to mention the collective concern!! I so enjoy this webcam along with the photos. 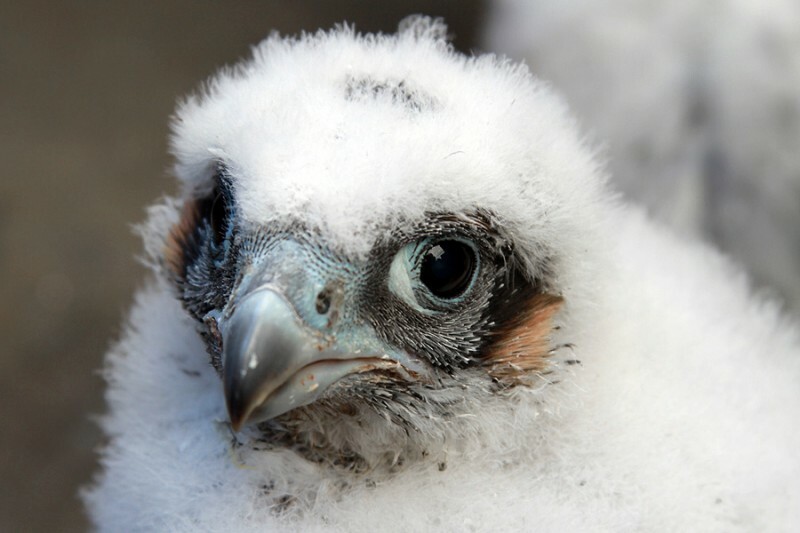 I notice that one fledgling seems to have whiter tufts of feathers. Is that reflective of the birth order? I believe you’re correct Audrey, the last to hatch would be the last to lose the white fluffy feathers. Peter – these are just spectacular! 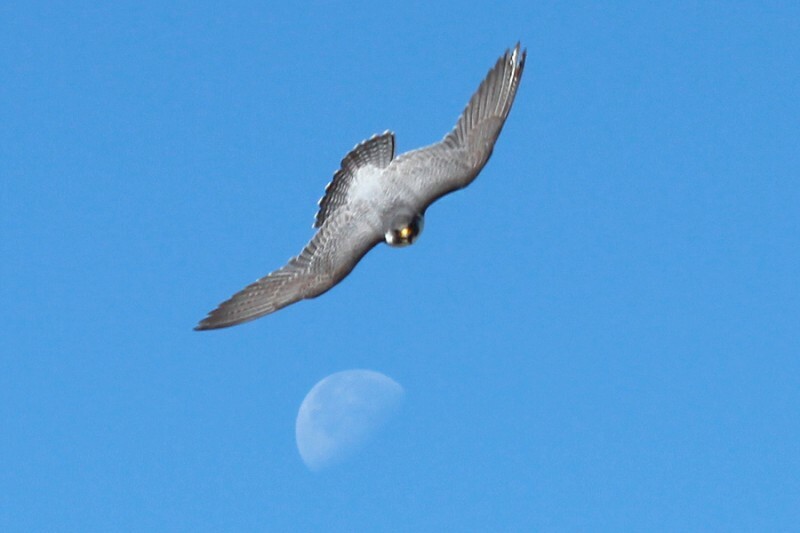 I have become so enamored with the falcons and appreciate your photography. So majestic! Number one is having a good time….at 4:50 PM, Wed. I looked and he was back in the box with the other three, but stepped back out on the perch in front and walked to the left and hopped off. 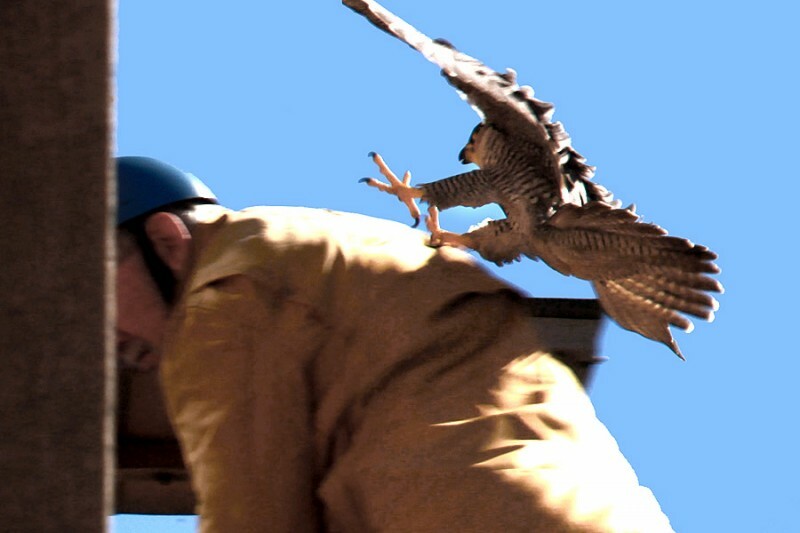 One of the other ones leaned way out and lifted a talon as if to follow his lead, but changed his mind. So I guess he has no problem leaving and coming back inside. It is amazing how quickly they grow and learn. Interesting to see how the one comes and goes now and I believe he was with his siblings last night too. I just hope they are getting fed by parents. I also watch Cornell lab of Ornithology red tailed hawks and heron cam and they are getting alot to eat. I am glad to have this opportunity with these nature cams. It is just wonderful and your pictures are just beautiful. I have searched for some info about the gender of the fab four, couldn’t find it on the webcam page nor on the Audubon Facebook page. Thank you Ingrid, I appreciate it – I’ve been told there’s 1 female and 3 males. I was wondering what will happen to the nest when the babies leave and fly away? will they ever come back? hi Jackson. 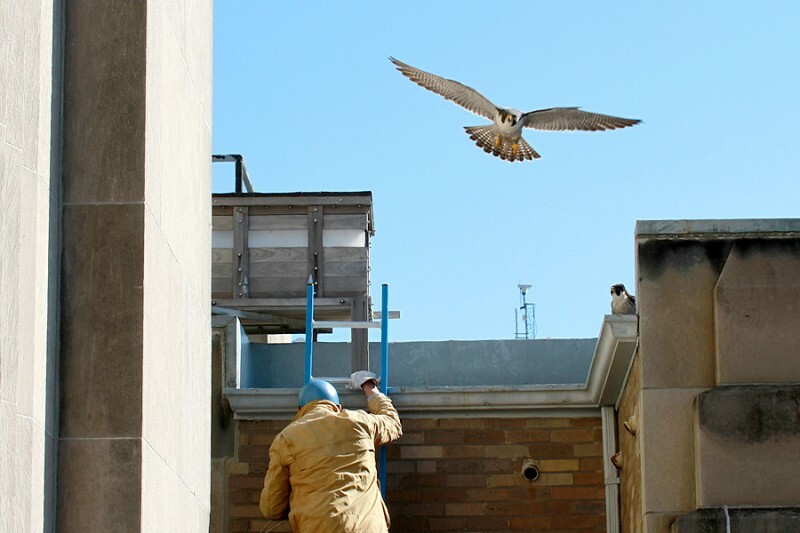 The fledglings will stay downtown for a few weeks learning to fly and hunt, but then they leave forever to find their own territories and they do not come back. The parents stay here all year but do not use the box, so it’s doubtful we will see any activity on the webcam after the last nestling fledges. We will all soon have to deal with “empty nest syndrome”. Thanks Peter I really apprecitae it. I have one more question. 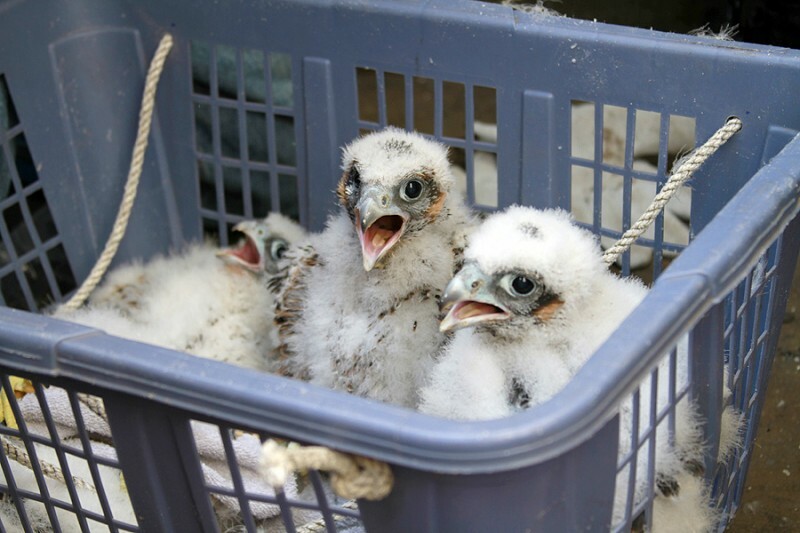 Do you think a different falcon family will move into the nest box? Will you shut the webcam down? Sorry that was two questions. 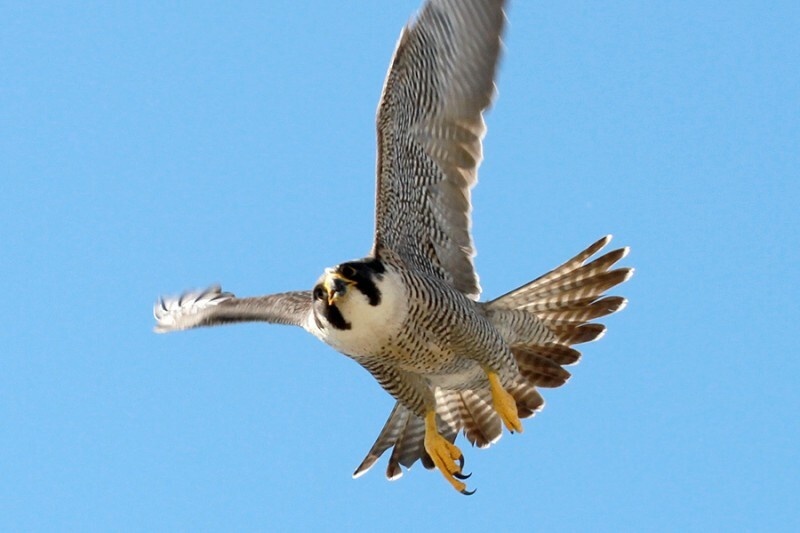 I’m really obsessed with the falcons! how come only one of the babies is still in the nest? hi Tony – Yes, all’s well – the last nestling was seen leaving the box this morning. 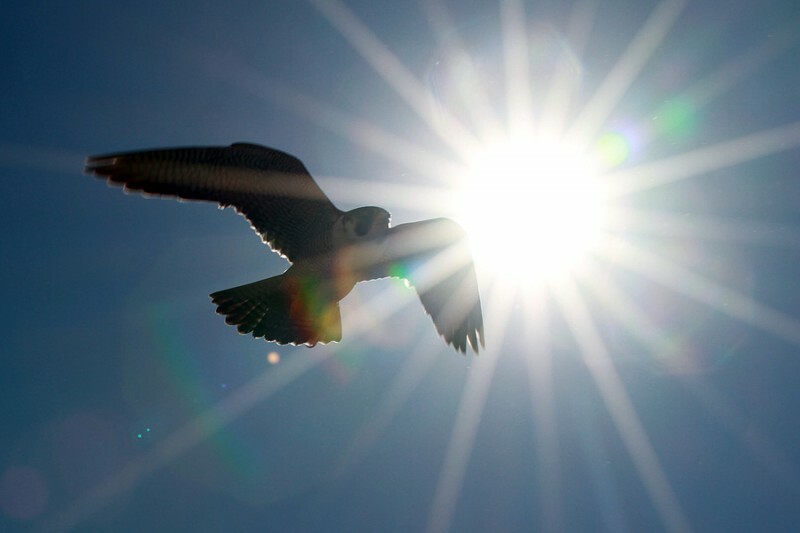 Hey Peter….my family is definately lost without the falcons….any sightings? Lynn B. Yes, Lynn, I saw mom giving flying lessons to one of the juveniles recently – new pictures are added above.